Gastric cancer is the fourth most commonly diagnosed cancer and the second most common cause of cancer-related death worldwide,, and the prognosis of advanced gastric cancer remains poor. Adenocarcinomas arising from gastric epithelium are the most common malignancies of the stomach (90% of cases). The lymphatic drainage from the stomach is anatomically complex and hard to predict the pattern of lymph node metastases from gastric cancer. However, there are lymph node station metastases that are more frequently observed depending on the tumor location. Furthermore, the incidence of the regional nodal metastases depends on the location of the tumor and its depth of gastric wall invasion. The presence of lymph node metastases is related with a reduction of the 5-year survival rate, despite the integration of adjuvant therapy to the surgery. A 66-year-old gentleman presented with a history of dysphagia for several months. Staging investigations confirmed a poorly differentiated adenocarcinoma involving the gastro-oesophageal junction and extending into the cardia of the stomach. 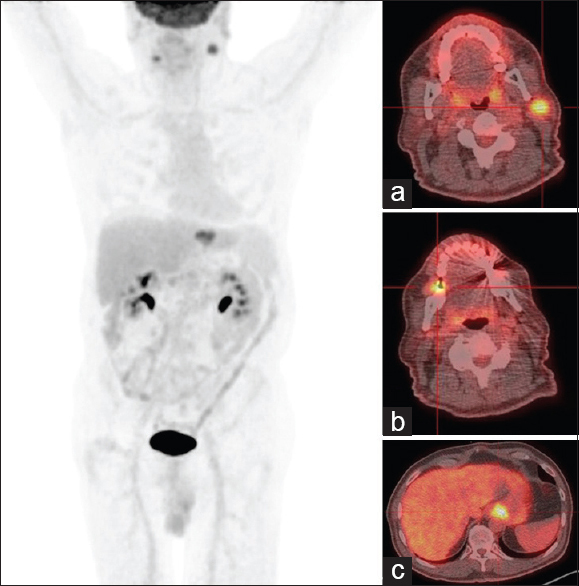 18F-fluorodeoxyglucose positron emission tomography/computerized tomography (18F-FDG PET/CT) showed high uptake within the tumor [Figure 1]c. Maximum standardized uptake value (SUVmax) was 7.4. Focal activity was noted in the right mandible which was dental in origin [Figure 1]b. There was also a focus of high FDG activity (SUVmax 6.2) in the left intraparotid nodule. This was initially thought to represent a Warthin's tumor [Figure 1]a. Ultrasound-guided biopsy was performed to confirm the diagnosis; however, the histology was consistent with a poorly differentiated adenocarcinoma metastasizing from the upper gastrointestinal tract. Adenocarcinoma of esophagus usually metastasizes to intra-abdominal sites while squamous cell carcinoma to intrathoracic sites. Skipped metastasis can be observed in 60% of early esophageal cancer. The intraparotid lymph node metastases are frequent from head and neck cancers. However, metastasis from a distant primary is uncommon and usually arises from lung, kidney, and breast. Only a single case has been reported of gastric carcinoma with cervical lymph node metastases bypassing the Virchow's node as a parotid metastasis from a squamous cell adenocarcinoma and a parotid recurrence of disease, after surgery, in a gastric adenocarcinoma. We are presenting the first case of lower esophageal carcinoma with metastasis only to the intraparotid lymph node simulating Warthin's tumor. Unfortunately, the presence of cervical or supraclavicular lymph nodes indicates Stage IV disease, which is associated with 5-year survival of 4%. The abdominal cancer, like gastric cancer, could skip mediastinal lymph nodes due to the lymphatic drainage from the thoracic duct. The Virchow's node is the left supraclavicular node on the left side of the neck where the lymphatic drainage of most of the body (from the thoracic duct) enters the venous circulation through the left subclavian vein. The metastasis blocks the thoracic duct leading to regurgitation into the surrounding nodes. In that case, probably for some morphological variation, the metastasis skips the Virchow's node and goes to the intraparotid node. Parotid gland metastases can, also, be best explained by the paravertebral plexus hematogenous route. Tumor cells might have traveled through the Batson plexus which is postulated as a direct path to the head and neck region whereby the liver and lungs are bypassed. This is a very rare finding and is the first time that a single parotid metastasis from an esophageal adenocarcinoma has been demonstrated with 18F-FDG PET/CT. Rosa F, Costamagna G, Doglietto GB, Alfieri S. Classification of nodal stations in gastric cancer. Transl Gastroenterol Hepatol 2017;2:2. Cho JW, Choi SC, Jang JY, Shin SK, Choi KD, Lee JH, et al. Lymph node metastases in esophageal carcinoma: An endoscopist's view. Clin Endosc 2014;47:523-9. Sgourakis G, Gockel I, Lyros O, Hansen T, Mildenberger P, Lang H, et al. Detection of lymph node metastases in esophageal cancer. Expert Rev Anticancer Ther 2011;11:601-12. Shimoyama T, Horie N, Yamada T, Ide F. Parotid lymph node metastasis from adenocarcinoma of the urachus. Dentomaxillofac Radiol 2000;29:185-8. Takashima T, Nakata B, Hatama M, Nomura S, Komoto M, Ishikawa T, et al. Gastric cancer with cervical lymph node metastasis as the first presentation: Report of a case. Int Surg 2008;93:295-9. Hsieh TC, Wu YC, Sun SS, Yang CF, Kao CH. Parotid gland metastasis from squamous cell carcinoma of esophagus detected by FDG PET/CT. Clin Nucl Med 2012;37:1001-2. Schoneveld JM, Hesp WL, Teune TM. Parotid metastasis from a gastroesophageal carcinoma: Report of a case. Dig Surg 2007;24:68-9. Howlader N, Noone AM, Krapcho M, Miller D, Bishop K, Altekruse SF, et al. SEER Cancer Statistics Review, 1975–2008. Bethesda, MD: National Cancer Institute; 2011.